Ice-Kold is an authorized HVAC tool repair center for many makes and models of HVAC Recovery Machines, Vacuum Pumps, and Meters. 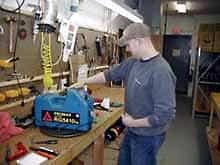 With over 20 years of HVAC tool repair experience, we are able to fix and repair most equipment. Please click below to see what equipment we can service for you. Ice-Kold® service center is your authorized HVAC tool repair center for all brands of Freon recovery machines. Companies like Appion, Robinair, Promax-Amprobe, Pinnacle, N.R.P., Thermaflow-Oz Savers, R.T.I., J/B Industries, Envirotech Systems, Inficon, White Industries, Ritchie-Recover-X, Thomas Industries, Van Steenburgh, Kold-Draft-Uniflow, Snap-On Tools, Ref Tec International, Sercon, CPS, James Kamm, ATP, Thermal, Penguin, Copeland, Bacharach, Fluoro-Tech, Milwaukee Tools, Rigid Tools, Lil-Retriever, RSI-Little Sucker, Uniweld, Watsco-A-1, and Marvac Scientific depend on Ice-Kold for professional repair services. We have factory-trained technicians that can answer your repair needs. Do not see your equipment on the HVAC tool repair center list? Give us a call and we would be glad to talk about your equipment and options to get your machines back to working order.